As digital parents, it’s probably the question we wrestle with the most. The child’s age. His or her temperament. The amount of time spent on other activities. The type or quality of screen time. And what if you have multiple children that fall into different age brackets? The American Academy of Pediatrics has recently published two policy statements: “Media and Young Minds” for pre-school age children and “Media Use in School-Aged Children and Adolescents” for school-age children and teens. These recommendations give parents specific, age-appropriate guidance on setting limits and creating a media plan for their family. 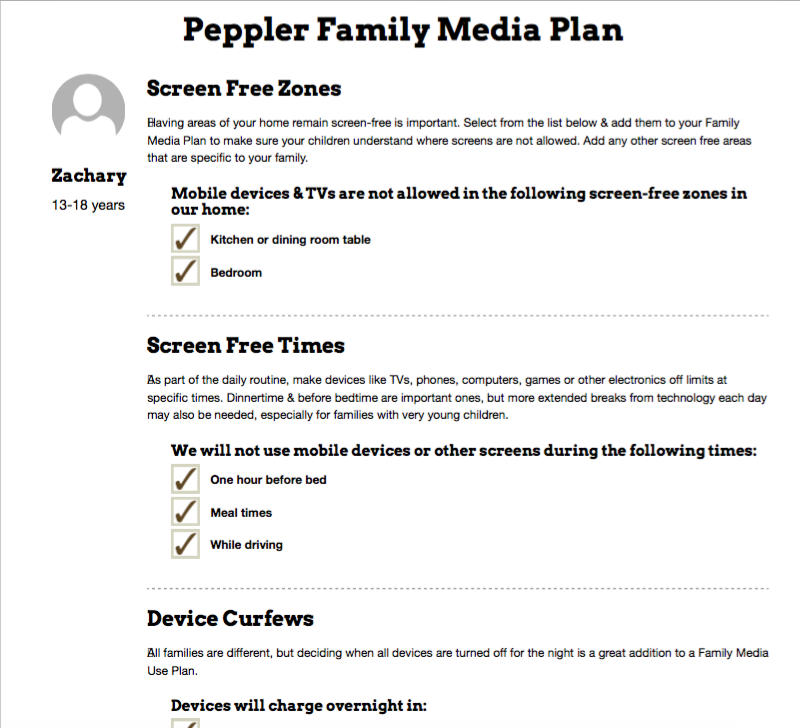 As a matter of fact, they’ve gone one step further and have created two nifty tools: a “Create Your Own Family Media Plan” tool and an interactive Media Time Calculator. 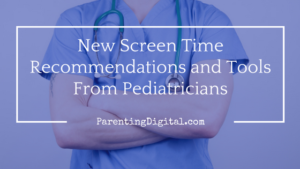 Children under two years of age should have very limited screen time. Video chatting (interacting live with another human face) is the best option for this age group. For pre-school children, certain well-designed apps and programs can be co-viewed with parents or caregivers. Programs like Sesame Street and other PBS programming, and apps that have positive reviews from Common Sense Media, can be effective in teaching cognitive, literacy, and social skills when an adult can re-teach and explain lessons and concepts. Parent involvement is critical at this age. Develop and follow a family media plan. Assure that children and teens are getting the recommended one hour of physical activity and 8-12 hours of sleep every day. No screens in the bedroom, and avoid screen exposure one hour before bedtime. Designate media-free times and media-free locations, and use those times and spaces for positive parent-child interaction. Co-view and co-select media with your children. In order to create a family media plan that aligns with the AAP’s recommendations, they’ve created a tool that lets you check or uncheck appropriate boxes to customize a plan for your family. The best feature is the ability to check different boxes for each of your children. For example, when I first launched the tool, I added each of my sons and their ages (which age range they are in), which brings up a slightly different set of checkboxes. The “No texting while driving” expectation came up for my teenage son, but not for my 11-year-old. You can add your own expectations to their pre-filled recommendation. They had a box under the “Manners Matter” section for not looking at a screen or texting while talking to someone. I instead added a line for “Tilt screen or device down, or turn it off, and remove earbuds when talking to someone.” One of my digital pet peeves. When you are finished, you can print out a copy of the plan. Actually, it prints a version of the plan for each child, with only those things you checked for each of them. The plans, in my case, were about four pages for each boy. While it’s not the prettiest document, it serves to make expectations clear for each child and gives parents a hard copy to help with the necessary conversations about media usage. The other interactive tool is a handy visual that shows just how much time screen usage sometimes cuts into other things. Like the Family Plan tool, the calculator allows you to add or subtract time from typical activities during your child’s day. There are certain categories (like physical activity and sleep) that are pre-filled, based on the AAP’s recommendations. You can add your own categories, too. Then, as you add and subtract time from each category, the available amount of screen time at the top, grows or shrinks. Just like we do, our children only have 24 hours in a day. After sleep and school, we begin adding in all the other activities (after-school stuff, homework, chores, family time, meals, etc.) and it’s pretty clear that screen time should be a very small part of their weekdays. Not only is this a good planning (and eye-opening!) 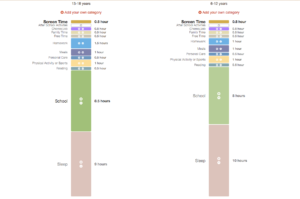 tool for parents, but for older kids, it could be a collaborative way of teaching time management strategies. Of course, these are just tools. Even the AAP doesn’t claim they are a complete fix or solution to the challenges of raising digital kids. What is clear, throughout all their recommendations, is the importance of positive and deliberate parental involvement. I don’t know about you, but this is the area of my digital parenting that needs the most work. It is far too easy to feel like all is well when you have the filters in place and you are limiting the screen time to so many minutes a day. Meanwhile, what they watch and how they watch is far more important (or detrimental) to their growth and well-being. The latest AAP recommendations are very clear reminders not to let that aspect of our parenting slip. What part of the new guidelines resonates the most with you? Add to the conversation in the comments below. Previous Post [Book Review] Screenwise: Helping Kids Thrive (and Survive) in Their Digital World Next Post Are your kids really that tech savvy?